Cool 18ct white gold is the perfect match for this shimmering sapphire, flanked by sparkling diamonds in this beautifully designed ring. 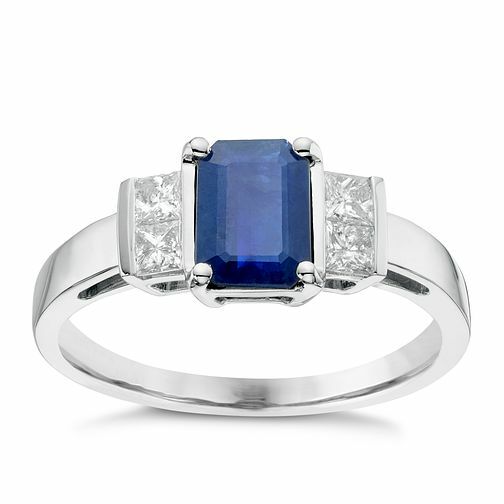 18ct White Gold 0.26ct Diamond & Sapphire Ring is rated 5.0 out of 5 by 1. Rated 5 out of 5 by Anonymous from Elegant Jewellry The ring and earrings were very pretty and pleased my wife no end. I have to say that I was expecting the stone to be bigger. However my wife was delighted with it. I guess this is one of the downsides of buying on line in that you do not get to handle the goods before buying.